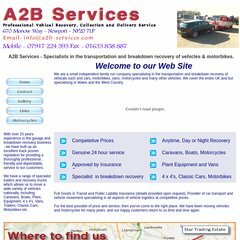 a2b-services.co.uk Car & Motorbike Breakdown and Motorcycle Recovery .. It is hosted by United Hosting Ipv4 Assignment (England, Hempstead,) using Apache web server. Its IP Number is 89.145.79.248. PING (89.145.79.248) 56(84) bytes of data. Pinging the server, resulted in a 98.1 ms response.